Playing off the form of "hot or not" websites,ArtNotArt creates a playful experience in which users vote on images, designating them either as Art or Not Art. Users are invited to write comments explaining their opinions, and share comments through Twitter and Facebook. 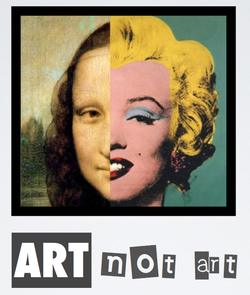 ArtNotArt aims to spark conversation about the meaning of the concept "Art" in contemporary culture. Experience Design: Jay David Bolter, Rebecca Rouse, Nachiketas Ramanujam, Sanika Mokashi. Acclaimed outsider artist, Howard Finster (1916-2001), was a Baptist minister in Summerville, GA, where he created a fantastical art environment, Paradise Garden. Several works from the garden are now displayed in Atlanta's High Museum of Art. pARadise gARden uses the Argon AR browser to bring the immersive feeling of Finster's garden into the museum environment and educate museum visitors about the original context of the works on display. Experience Design: Jay David Bolter, Fred Leighton, Rebecca Rouse, Nachiketas Ramanujam, Sanika Mokashi, Chanju Lee, Libo Su. 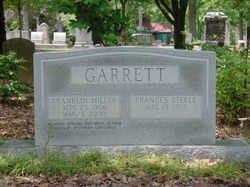 Handheld AR Experience in Atlanta's historic Oakland Cemetery. The Voices of Oakland uses Augmented Reality (AR) to introduce the visitor to the personal histories of the cemetery. Carrying an iPhone, the visitor walks among the graves and listens to the voices of historical figures interred at Oakland. The visitor can tailor the experience to suit her interests through the touchscreen interface. The Voices of Oakland is a prototype created using Argon, an AR browser which was conceived and implemented by the Augmented Environments Lab in the GVU Center at the Georgia Institute of Technology. To experience Voices of Oakland, download Argon to your iPhone, then open this site and click here. Experience Design: Jay David Bolter, Rebecca Rouse, Jenifer Vandagriff, Steven Dow, Maribeth Gandy, Jaemin Lee, Danny Muller, Nachiketas Ramanujam, Fred Leighton, Sanika Mokashi, Chanju Lee, Libo Su. Music: Brendan Padgett. Voices: Manny Oliveira, Jackie Pricha, Steven Wunch. 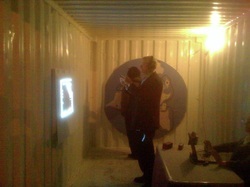 Handheld AR Art Installation about the Shipping Container System. Installed at the ACM Creativity and Cognition 2009 conference at the Berkeley Art Museum, [inbox] is an art installation about the shipping container system and its inventor, Malcom McLean. The experience is set inside an ISO standard 20' shipping container, and uses handheld AR, 35mm slides, a map, a mannequin, audio and paper cut-and-fold models to tell the story of the invention of the shipping container system, and guide visitors through our complex relationships with the system today. To learn more, watch a video about the installation here and read a paper here. Experience Design: Evan Barba, Rebecca Rouse. Music: Oliver Jan. Voice: Brendan Padgett. 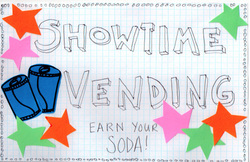 Created in the DWIG (Digital World Image Group) project studio and presented as a proof-of-concept project for Digital Media Demo Day in May 2010, Showtime Vending playfully converts the space around a soda can vending machine into a street performance venue for both co-located and virtual audiences. Spectators vote on performances, which are videoed and streamed online, and determine if the performer has earned a free can of soda. To learn more, wach a video about the project here. Experience Design: Michael Nitsche, Andrew Quitmeyer, Rebecca Rouse, Thomas Lodator, Vignesh Swaminathan, Andrew Roberts, Matthew Drake. What is the nature of the museum institution in contemporary society? Is there a place for digital art and interactive experiences in the museum of today? 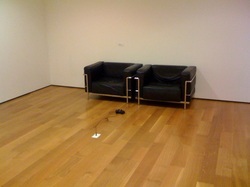 Special interest group, The McKnight Center for the Arts, donated two non-destructive works of experimental digital art to The High Museum in Atlanta, GA in 2009 and 2010, respectively. Reflections on these installations were presented in a performance at the Blue Tower Arts Gallery in 2010. To learn more, see a clip from the performance here. Designed to investigate theories about liveness written about by theorists such as Philip Auslander and Peggy Phelan, Club Verona re-imagines the fight scenes from Shakespeare's Romeo and Juliet as breakdance battles. With Montagues played by members of Georgia Tech's Break Dance club, TekStyles, and Capulets played by SecondLife avatars, the performance was presented to an audience at the Digital Media Demo Day in May 2009.